I spent most of today researching sewing machines. My dear friend of 16 years is no longer working. Like so many companies, Elna Sewing Machines sold their name and the quality machines of yesterday are no longer manufactured. I did manage to find a sew/vac shop about an hour away that listed a replacement foot control. I will call on Monday and see if they have them in stock. If so I will drive down on Tuesday and see if that is the problem with this machine. I really hope so. I have not seen any machine that has all the things I love about this Elna. It is Swiss made, so a Bernina would be close. Berninas are really expensive though, and they don’t have the same amount of space on the right side, nor the variety of stitches. I don’t really want an embroidery machine. I looked at the Viking Sapphires. They are less expensive and have more space on the right side. The reviews are not good, especially for garment sewing, which is what I do. I talked to Rick about the prices of the Berninas. All he said was that I should make sure it can stitch canvas, because we will probably living in a tent once he retires. At least we live in a warm state. This entry was posted on Sunday, July 5th, 2009 at 3:00 am and is filed under Sewing. Tagged: Sewing. You can feed this entry. You can leave a response, or trackback from your own site. Thank goodness you got through the sewing for your son before this happened! Just found your site and your pictures on Flickr when I was looking for information on the Elna 9000 DIVA. I just found out about this machine two weeks ago and am trying to get one. I also have a Bernina 830LE. I see you were at the 2009 Long Beach Quilt Convention when the Bernina 830 was there. I was there too! Your projects are just lovely! 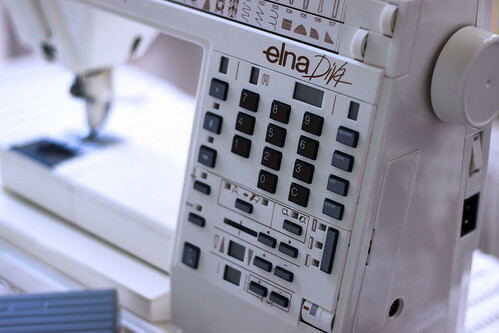 I buying the Elna Diva what do think it worth, The lady said she paid $3000.00 and very little sewing time on the machine, I wondering what I should pay everything is with the machine. She ha a Bernina newer that she uses. « Happy 4th of July! !